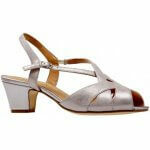 Van Dal Libby II women's wide fitting dressy sandal. Manufactured from a leather upper with a soft cushioned insole that adds lasting comfort. It features a beautiful cross strap design with a buckle fastening that allows for adjustability and security when wearing. A great option for ladies who need a wider fit as Van Dal Libby II is a wide E width fitting. The 45mm thick heel adds a height boots whilst still maintaining stability.